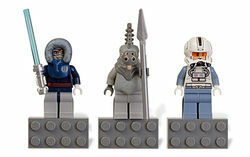 853130 Magnet Set: Anakin, Thi-Sen and Clone Pilot is a Star Wars Magnet set, featuring Anakin Skywalker in a parka, Thi-Sen and a Phase II Clone Pilot. This is a description taken from LEGO.com. Please do not modify it. Let the heroes of the coldest Clone Wars™ battles watch over your freezer! The Clone Wars™ are coming soon, from the frozen planet Orto Plutonia, to your kitchen’s frozen food section! Authentic LEGO® Star Wars™: The Clone Wars™ Anakin Skywalker, Thi-Sen and Clone Pilot minifigures, attached to sturdy LEGO magnets. Sticks to any metal surface! Makes a great gift for any LEGO or Star Wars fan! Minifigures are not detachable from 2x4 bricks. Facts about "853130 Magnet Set Anakin, Thi-Sen and Clone Pilot"
Let the heroes of the coldest Clone Wars™ battles watch over your freezer! This page was last edited on 10 January 2016, at 00:06.